In algebra, which is a broad division of mathematics, abstract algebra is the study of algebraic structures. Algebraic structures include groups, rings, fields, modules, vector spaces, lattices, and algebras. The term abstract algebra was coined in the early 20th century to distinguish this area of study from the other parts of algebra. In algebra, ring theory is the study of rings—algebraic structures in which addition and multiplication are defined and have similar properties to those operations defined for the integers. Ring theory studies the structure of rings, their representations, or, in different language, modules, special classes of rings, as well as an array of properties that proved to be of interest both within the theory itself and for its applications, such as homological properties and polynomial identities. The University of Göttingen is a public research university in the city of Göttingen, Germany. Founded in 1734 by George II, King of Great Britain and Elector of Hanover, and starting classes in 1737, the university is the oldest in the state of Lower Saxony and the largest in student enrollment, which stands at around 31,500. Number theory is a branch of pure mathematics devoted primarily to the study of the integers. German mathematician Carl Friedrich Gauss (1777–1855) said, "Mathematics is the queen of the sciences—and number theory is the queen of mathematics." Number theorists study prime numbers as well as the properties of objects made out of integers or defined as generalizations of the integers. Johann Carl Friedrich Gauss (; German: Gauß[ˈkaɐ̯l ˈfʁiːdʁɪç ˈɡaʊs]; Latin: Carolus Fridericus Gauss; was a German mathematician and physicist who made significant contributions to many fields in mathematics and sciences. Sometimes referred to as the Princeps mathematicorum and "the greatest mathematician since antiquity", Gauss had an exceptional influence in many fields of mathematics and science, and is ranked among history's most influential mathematicians. At that time, the University of Berlin, not Göttingen, was the main facility for mathematical research in Germany. Thus Dedekind went to Berlin for two years of study, where he and Bernhard Riemann were contemporaries; they were both awarded the habilitation in 1854. Dedekind returned to Göttingen to teach as a Privatdozent , giving courses on probability and geometry. He studied for a while with Peter Gustav Lejeune Dirichlet, and they became good friends. Because of lingering weaknesses in his mathematical knowledge, he studied elliptic and abelian functions. Yet he was also the first at Göttingen to lecture concerning Galois theory. About this time, he became one of the first people to understand the importance of the notion of groups for algebra and arithmetic. Georg Friedrich Bernhard Riemann was a German mathematician who made contributions to analysis, number theory, and differential geometry. In the field of real analysis, he is mostly known for the first rigorous formulation of the integral, the Riemann integral, and his work on Fourier series. His contributions to complex analysis include most notably the introduction of Riemann surfaces, breaking new ground in a natural, geometric treatment of complex analysis. His famous 1859 paper on the prime-counting function, containing the original statement of the Riemann hypothesis, is regarded as one of the most influential papers in analytic number theory. Through his pioneering contributions to differential geometry, Riemann laid the foundations of the mathematics of general relativity. He is considered by many to be one of the greatest mathematicians of all time. A Technische Hochschule is a type of university focusing on engineering sciences in Germany. Previously, it also existed in Austria, Switzerland, the Netherlands, and Finland. In the 1970s and the 1980s, the Technische Hochschule emerged into the Technische Universität (German) or Technische Universiteit (Dutch). Since 2009, several German universities of applied sciences were renamed to Technische Hochschulen. The French Academy of Sciences is a learned society, founded in 1666 by Louis XIV at the suggestion of Jean-Baptiste Colbert, to encourage and protect the spirit of French scientific research. It was at the forefront of scientific developments in Europe in the 17th and 18th centuries, and is one of the earliest Academies of Sciences. The University of Zurich, located in the city of Zürich, is the largest university in Switzerland, with over 25,000 students. It was founded in 1833 from the existing colleges of theology, law, medicine and a new faculty of philosophy. While teaching calculus for the first time at the Polytechnic school, Dedekind developed the notion now known as a Dedekind cut (German: Schnitt), now a standard definition of the real numbers. The idea of a cut is that an irrational number divides the rational numbers into two classes (sets), with all the numbers of one class (greater) being strictly greater than all the numbers of the other (lesser) class. For example, the square root of 2 defines all the nonnegative numbers whose squares are less than 2 and the negative numbers into the lesser class, and the positive numbers whose squares are greater than 2 into the greater class. Every location on the number line continuum contains either a rational or an irrational number. Thus there are no empty locations, gaps, or discontinuities. Dedekind published his thoughts on irrational numbers and Dedekind cuts in his pamphlet "Stetigkeit und irrationale Zahlen" ("Continuity and irrational numbers");  in modern terminology, Vollständigkeit, completeness . In 1888, he published a short monograph titled Was sind und was sollen die Zahlen? ("What are numbers and what are they good for?" Ewald 1996: 790),  which included his definition of an infinite set. He also proposed an axiomatic foundation for the natural numbers, whose primitive notions were the number one and the successor function. The next year, Giuseppe Peano, citing Dedekind, formulated an equivalent but simpler set of axioms, now the standard ones. Georg Ferdinand Ludwig Philipp Cantor was a German mathematician. He created set theory, which has become a fundamental theory in mathematics. Cantor established the importance of one-to-one correspondence between the members of two sets, defined infinite and well-ordered sets, and proved that the real numbers are more numerous than the natural numbers. In fact, Cantor's method of proof of this theorem implies the existence of an "infinity of infinities". He defined the cardinal and ordinal numbers and their arithmetic. Cantor's work is of great philosophical interest, a fact of which he was well aware. In mathematics, a transcendental number is a real or complex number that is not algebraic—that is, it is not a root of a nonzero polynomial equation with integer coefficients. The best-known transcendental numbers are π and e. Though only a few classes of transcendental numbers are known, transcendental numbers are not rare. Indeed, almost all real and complex numbers are transcendental, since the algebraic numbers are countable while the sets of real and complex numbers are both uncountable. All real transcendental numbers are irrational, since all rational numbers are algebraic. The converse is not true: not all irrational numbers are transcendental; e.g., the square root of 2 is irrational but not a transcendental number, since it is a solution of the polynomial equation x2 − 2 = 0. Another irrational number that is not transcendental is the golden ratio, or , since it is a solution of the polynomial equation x2 − x − 1 = 0. In the philosophy of mathematics, the abstraction of actual infinity involves the acceptance of infinite entities, such as the set of all natural numbers or an infinite sequence of rational numbers, as given, actual, completed objects. This is contrasted with potential infinity, in which a non-terminating process produces a sequence with no last element, and each individual result is finite and is achieved in a finite number of steps. The Riemann hypothesis is one of the most important conjectures in mathematics. It is a statement about the zeros of the Riemann zeta function. Various geometrical and arithmetical objects can be described by so-called global L-functions, which are formally similar to the Riemann zeta-function. One can then ask the same question about the zeros of these L-functions, yielding various generalizations of the Riemann hypothesis. Many mathematicians believe these generalizations of the Riemann hypothesis to be true. The only cases of these conjectures which have been proven occur in the algebraic function field case. Algebraic number theory is a branch of number theory that uses the techniques of abstract algebra to study the integers, rational numbers, and their generalizations. Number-theoretic questions are expressed in terms of properties of algebraic objects such as algebraic number fields and their rings of integers, finite fields, and function fields. These properties, such as whether a ring admits unique factorization, the behavior of ideals, and the Galois groups of fields, can resolve questions of primary importance in number theory, like the existence of solutions to Diophantine equations. 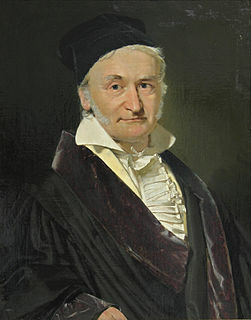 Johann Peter Gustav Lejeune Dirichlet was a German mathematician who made deep contributions to number theory, and to the theory of Fourier series and other topics in mathematical analysis; he is credited with being one of the first mathematicians to give the modern formal definition of a function. In mathematics, analytic number theory is a branch of number theory that uses methods from mathematical analysis to solve problems about the integers. It is often said to have begun with Peter Gustav Lejeune Dirichlet's 1837 introduction of Dirichlet L-functions to give the first proof of Dirichlet's theorem on arithmetic progressions. It is well known for its results on prime numbers and additive number theory. Leopold Kronecker was a German mathematician who worked on number theory, algebra and logic. He criticized Georg Cantor's work on set theory, and was quoted by Weber (1893) as having said, "Die ganzen Zahlen hat der liebe Gott gemacht, alles andere ist Menschenwerk". Kronecker was a student and lifelong friend of Ernst Kummer. In number theory an ideal number is an algebraic integer which represents an ideal in the ring of integers of a number field; the idea was developed by Ernst Kummer, and led to Richard Dedekind's definition of ideals for rings. An ideal in the ring of integers of an algebraic number field is principal if it consists of multiples of a single element of the ring, and nonprincipal otherwise. By the principal ideal theorem any nonprincipal ideal becomes principal when extended to an ideal of the Hilbert class field. This means that there is an element of the ring of integers of the Hilbert class field, which is an ideal number, such that the original nonprincipal ideal is equal to the collection of all multiples of this ideal number by elements of this ring of integers that lie in the original field's ring of integers. Vorlesungen über Zahlentheorie is the name of several different textbooks of number theory. The best known was written by Peter Gustav Lejeune Dirichlet and Richard Dedekind, and published in 1863. Others were written by Leopold Kronecker, Edmund Landau, and Helmut Hasse. They all cover elementary number theory, Dirichlet's theorem, quadratic fields and forms, and sometimes more advanced topics. In mathematics, the Dedekind zeta function of an algebraic number field K, generally denoted ζK(s), is a generalization of the Riemann zeta function. It can be defined as a Dirichlet series, it has an Euler product expansion, it satisfies a functional equation, it has an analytic continuation to a meromorphic function on the complex plane C with only a simple pole at s = 1, and its values encode arithmetic data of K. The extended Riemann hypothesis states that if ζK(s) = 0 and 0 < Re(s) < 1, then Re(s) = 1/2. Heinrich Martin Weber was a German mathematician. Weber's main work was in algebra, number theory, and analysis. He is best known for his text Lehrbuch der Algebra published in 1895 and much of it is his original research in algebra and number theory. His work Theorie der algebraischen Functionen einer Veränderlichen established an algebraic foundation for Riemann surfaces, allowing a purely algebraic formulation of the Riemann-Roch theorem. Weber's research papers were numerous, most of them appearing in Crelle's Journal or Mathematische Annalen. He was the editor of Riemann's collected works. In number theory, a Hecke character is a generalisation of a Dirichlet character, introduced by Erich Hecke to construct a class of L-functions larger than Dirichlet L-functions, and a natural setting for the Dedekind zeta-functions and certain others which have functional equations analogous to that of the Riemann zeta-function. In mathematics, a real number is a value of a continuous quantity that can represent a distance along a line. The adjective real in this context was introduced in the 17th century by René Descartes, who distinguished between real and imaginary roots of polynomials. The real numbers include all the rational numbers, such as the integer −5 and the fraction 4/3, and all the irrational numbers, such as √2. Included within the irrationals are the transcendental numbers, such as π (3.14159265...). In addition to measuring distance, real numbers can be used to measure quantities such as time, mass, energy, velocity, and many more. In mathematics, the irrational numbers are all the real numbers which are not rational numbers, the latter being the numbers constructed from ratios of integers. When the ratio of lengths of two line segments is an irrational number, the line segments are also described as being incommensurable, meaning that they share no "measure" in common, that is, there is no length, no matter how short, that could be used to express the lengths of both of the two given segments as integer multiples of itself. Georg Cantor published his first set theory article in 1874, and it contains the first theorems of transfinite set theory, which studies infinite sets and their properties. One of these theorems is "Cantor's revolutionary discovery" that the set of all real numbers is uncountably, rather than countably, infinite. This theorem is proved using Cantor's first uncountability proof, which differs from the more familiar proof using his diagonal argument. The title of the article, "On a Property of the Collection of All Real Algebraic Numbers", refers to its first theorem: the set of real algebraic numbers is countable. In 1879, Cantor modified his uncountability proof by using the topological notion of a set being dense in an interval. In set theory, the Schröder–Bernstein theorem states that, if there exist injective functions f : A → B and g : B → A between the sets A and B, then there exists a bijective function h : A → B. In terms of the cardinality of the two sets, this means that if |A| ≤ |B| and |B| ≤ |A|, then |A| = |B|; that is, A and B are equipotent. This is a useful feature in the ordering of cardinal numbers. Biermann, Kurt-R (2008). "Dedekind, (Julius Wilhelm) Richard". Complete Dictionary of Scientific Biography . 4. Detroit: Charles Scribner's Sons. pp. 1–5. ISBN 978-0-684-31559-1. Wikimedia Commons has media related to Richard Dedekind . O'Connor, John J.; Robertson, Edmund F., "Richard Dedekind", MacTutor History of Mathematics archive , University of St Andrews .